Fellowship Previews: Valiant Recruits Massive Cast of Comedy All-Stars for UNITY #25 – A Super-Sized Final Issue Humor Spectacular! 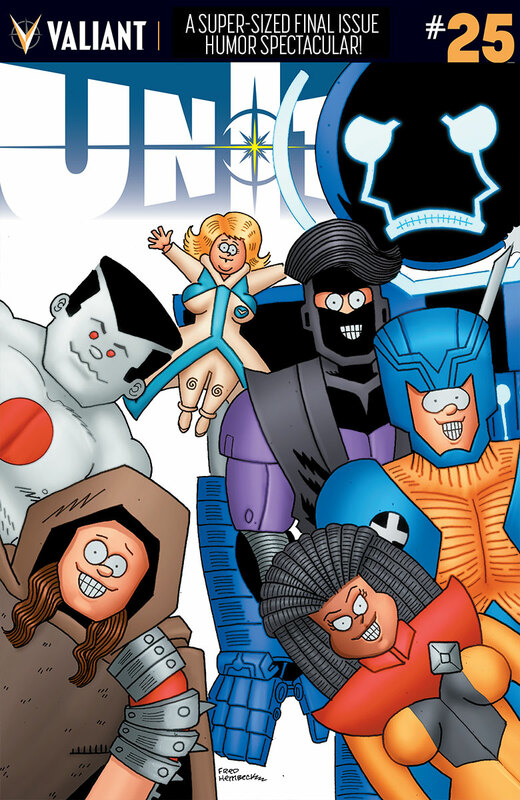 Valiant Recruits Massive Cast of Comedy All-Stars for UNITY #25 – A Super-Sized Final Issue Humor Spectacular! 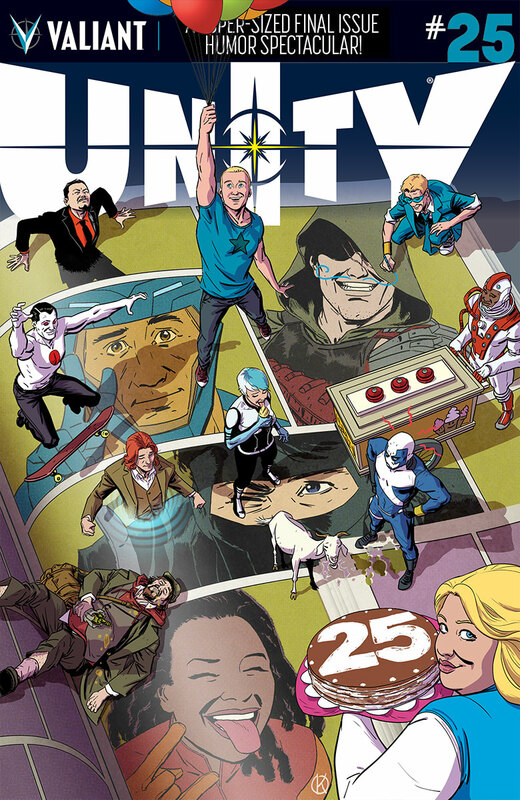 Valiant is proud to announce UNITY #25 – a super-sized, 48-page finale for Valiant's best-selling superteam, starring X-O Manowar, Livewire, Ninjak, Bloodshot, Divinity, Faith, Quantum and Woody, the Death-Defying Dr. Mirage, and pretty much the whole darn Valiant Universe! 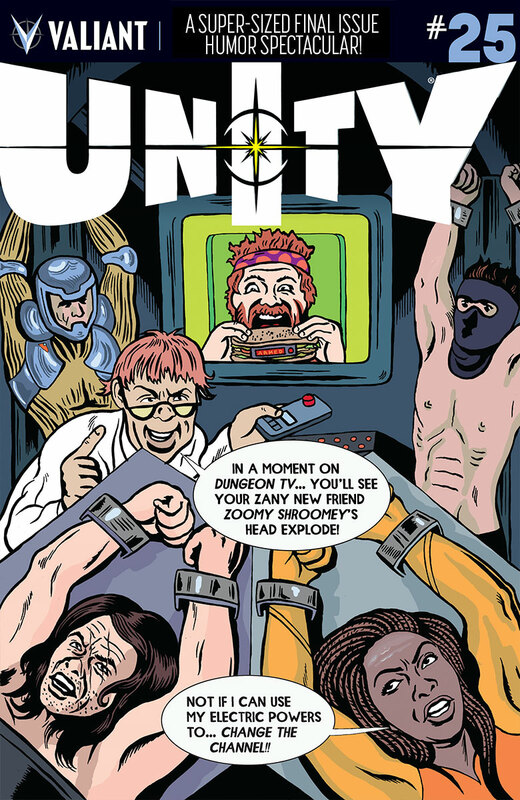 Arriving in December, the UNITY #25 final issue humor spectacular will feature stories and shorts from a colossal roster of Unity veterans and comics comedy VIPs, including Matt Kindt (DIVINITY),James Asmus (QUANTUM AND WOODY), Donny Cates & Eliot Rahal (The Paybacks), Elliott Kalan (The Daily Show), Kano (THE DELINQUENTS), Daniel Kibblesmith (The Late Show with Stephen Colbert), Michael Kupperman (Tales Designed to Thrizzle), Rafer Roberts (ARCHER & ARMSTRONG #25), Tim Siedell (The Nightly Show), and Ty Templeton (Batman Adventures) – plus the comic book debut of comedian and radio host Tom Scharpling (The Best Show)! New York Times best-selling writer and Valiant superstar Matt Kindt presents the final chapter of his acclaimed two-year run on Valiant's premier superteam…and then all-out chaos ensues as Valiant says goodbye and passes the reins to an all-star line-up of writers, artists, and humorists to chronicle the unusual, the offbeat, and the never-before-seen tales of the team that became a legend in their own time…the one and only Unity! Think Bloodshot only joined the team long enough to fight the Armor Hunters? WRONG! Discover his newly declassified Unity missions! You saw Faith help Unity fight their opposite counterparts, The United… Now find out find out how else she assisted the team! Remember that time Quantum and Woody's goat joined the most elite assemblage of heroes that the Valiant Universe has ever known? No? Well, it happened! WE PROMISE. 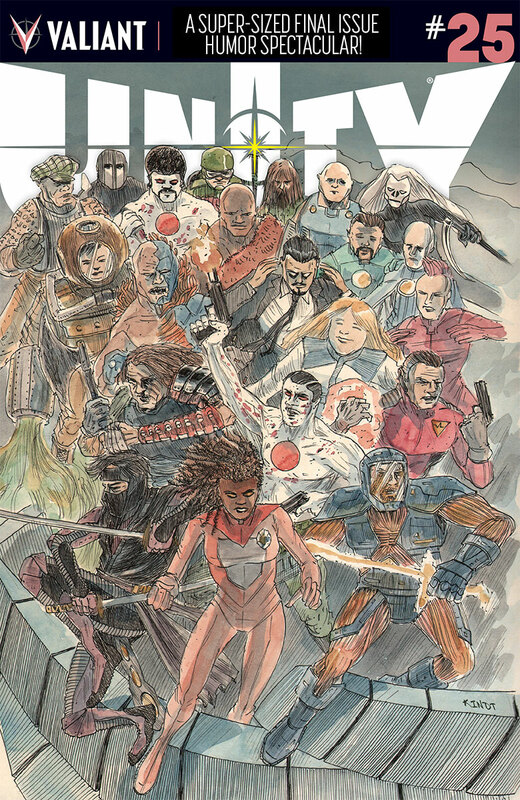 Featuring covers by Valiant superstar Kano (QUANTUM AND WOODY), multiple Eisner Award nominee Matt Kindt (Mind MGMT), legendary cartoonist Fred Hembeck (Marvel Age), and Eisner Award winner Michael Kupperman (Tales Designed to Thrizzle), the Valiant Universe's most formidable team of heroes collides with a massive cast of comedy all-stars this winter in UNITY #25 – a 48-page free-for-all on sale in December!